Forster's terns are commonly seen in the Bay Area fall through spring. Photo by Ingrid Taylar, Wikimedia Commons. As the seasons turn, so the terns return, return, return (go ahead and hum along to the old Byrds song) to the Bay Area. 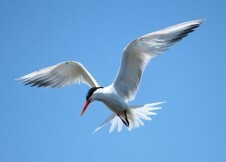 One of nature’s amazing flyers, we’re fortunate to have so many terns visit throughout the year. To the casual beachgoer, they may look alike. But in fact, we have a whole kaleidoscope of tern species migrating to the Bay Area from as far away as the Arctic and Antarctic. Let’s take a closer look at some of our amazing tern diversity. Caspian terns, the world’s largest terns, have a nesting colony on Brooks Island (an East Bay Regional Park.) They'll nest there, then winter in Baja and southern Mexico. This is a large, healthy colony, though a report noted reductions in the colony from 2003-2009 largely due to increased pressure from a recently established colony of California gulls. The study was done to assess relocating Caspians from their largest colony in Oregon, where they were taking too many young, endangered salmon smolt. Endangered California least terns forage for small fish in nearshore waters in the Bay Area, the northern edge of their range. Photo by Peter Wallack, Wikimedia Commons. We also host the smallest American tern, the California least tern, with the largest, northernmost colony at Alameda Point in the East Bay. Read a first-hand report on the Alameda volunteer predator watch program written for a KQED QUEST blog last summer. 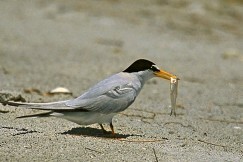 The endangered California least terns have an intensive management program overseen by both federal and local agencies. The U.S. Department of Fish and Wildlife manages the largest least tern colony at Alameda Point with lots of help from the Friends of the Alameda Wildlife Refuge, which is part of the Golden Gate Audubon Society. A second, smaller but important nest site is managed by the East Bay Regional Parks at Hayward Regional Shoreline Park. They have many volunteers that help monitor the colony. Though the least terns have departed their nesting colonies now, a few have been spotted lingering in the area. Most of the colonies have winged away south for their wintering grounds in Mexico. Forster’s terns are another common tern in the Bay Area. Though they breed in the interior states, they winter along the coast and on our bay. They’re the medium-size birds seen most often in our area. You can look for them hovering and diving for fish fall through spring. Another turn of the seasons and we get Elegant terns, with 90% of their population breeding on Isla Rasa, a small island off the coast of Mexico. Enjoy this great video of the colony and a short profile of Dr. Enriqueta Velarde, the woman who champions this bird sanctuary. With all their eggs in one basket -- or in this case, one island -- conservation heroes like her are vital to the species preservation. Once the Elegant terns disperse from their nesting colony, they head north following schools of fish and often stop in the Bay Area. They can be seen through the fall with their long black crests blowing like unruly comb-overs in the breeze. Then they’ll head south again, following the sun and fish, for the winter. Elegant terns disperse north from their breeding grounds and can be seen in the summer and fall. Photo by Regular Daddy, Wikimedia Commons. The champion flyers, Arctic terns, breed in the Artic circle and summer in the Antarctic: the ultimate endless summer birds. They have the longest migration of any animal. Keep an eye out for them on their southern migration over the fall and winter when they stop off in the Bay Area and eagerly welcomed by bird watchers. You can test your tern identification skills with this pictorial quiz from the Audubon Society. 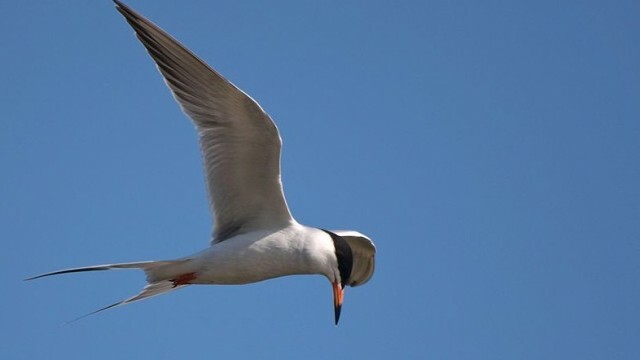 To go for a walk and observe terns, simply choose one of the bay’s shoreline areas. You can join a walk with East Bay Regional Park naturalists or with the Audubon Society field trips to learn more from experienced birders. No previous bird watching experience is necessary.